We were afraid to think much about spring during the month of March up in Michigan. Too many days gave us false hope of warmth, a Chinook wind might melt the ice and show frozen green from the previous summer, and then a heavy snow could fall and cover our dreams of sun. In college, if we found money, a trip to Florida made us think that by going away for a week we would come back to a vigorous spring and a state in bloom. I was working in the dormitory cafeteria and had met a farm girl who was taking up my time. Murph suggested I try to save a few hundred dollars and ask her if she wanted to travel to Florida for spring break, and he would ask his girlfriend. Florida was a location where I thought people with money visited and I had no concept of myself on a beach but he convinced me to take the trip, and to take chances. Murph had a car and in the house where he grew up there was a dry sauna. I saw it on a weekend when he invited a group of us from Abbott Hall to South Bend for a hockey game between Michigan State and Notre Dame. The sauna was bigger than my bedroom at our house south of Flint but Murph was not amazed by his circumstances. There was also a pool table upstairs and his parents had left for Florida so we were able to have a party after the hockey games. We drove his nice car down Interstate 75 and the old Dixie Highway, the road that had led homesick southern boys north from the farms to the car factories and the steel plants that had jobs after World War II. Cold rain splattered against the windshield as we dreamed of the beach in Ft. Lauderdale and finding a motel that was no more than $25 a night. When the Atlantic came into view along A1A, I was as breathless as I was tired but the sun was suddenly warm and the farm girl smiled beside me as Murph sipped coffee and his friend Patty chattered in the front seat. We were young and our lives were endless and the road was smooth and flat. A few weeks ago, there was a demonstration on the campus of Google in California that few people noticed. 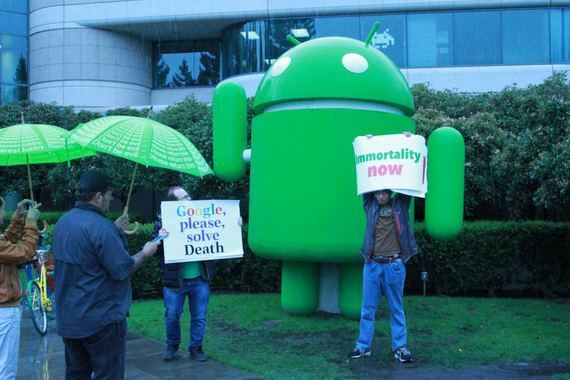 A small group of individuals stood outside the Googleplex and held signs that said, "Google, please solve death," and, "Immortality now." The modest gathering was in response to Google's announcement of a new initiative called Calico, which is designed to focus on health and well being, but also senescence and the ravages of time and its affects on the human body. A number of people are hopeful that the planet's most powerful technology company has begun to concentrate science and research on transhumanism. Transhumanism is an idea that we can transcend mortal definitions of our lives. There are already discussions about uploading consciousness and memory to computer networks to enable the human experience to continue even if only in an incorporeal form. Science is presently giving us robotics that move artificial limbs with only thought and there is research to stop the cellular decay that leads to senescence and the failure of organs and biological functionality. British researcher Aubrey de Grey believes that age is simply a disease that can be cured. He has identified seven ways that human bodies fall into decay and believes they can all be fixed with science and medicine. He is developing what he calls viable Strategies for Engineered Negligible Senescence (SENS), which he is convinced can end aging and our acceptance of death after a traditional life span. De Grey is working to prove that the metabolic and cellular processes that cause aging can be reversed and humanity can eventually approach mortality. The science to save us, de Grey insists, already exists, and the only challenges are money and continuing research. De Grey, in an interview with German television, said that the first human to live 1000 years is alive today and may even be as much as 60 years of age. The sun turned us pink that week on the beach in Ft. Lauderdale but we told ourselves we would be brown and Michigan would be warm when we went back north. Nothing could hurt us and we swam and ran and ate and drank and danced with improbable energy. There was not a moment when Murph was not smiling the entire week and he believed more than me that everything was green and warm up north of the Mason-Dixon. Murph eventually took off on a career that made him an executive in major corporations and when the farm girl and I were living in a broken down adobe down on the border he already had airline privileges and flew down to sleep on our porch and listen to the shuffle of palm fronds in the wind. 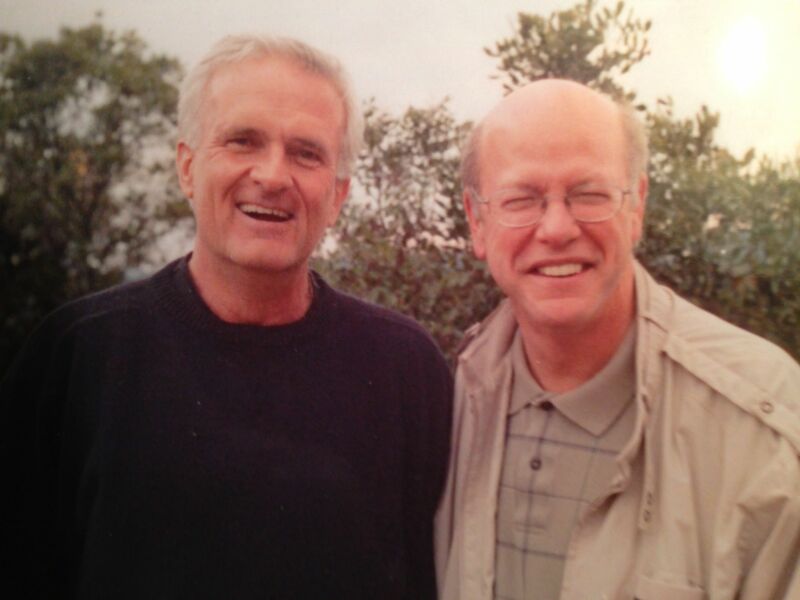 Murph and I hung out together for a while in Denver and over the decades our lives intersected often enough that we were able to keep alive a friendship that had survived beyond all others from my university days. Everything, to him, was funny, and for me, mostly serious and demanding of intellectual rigor. Our perspectives mutually leavened our lives and sustained our friendship. As Murph's career ended, he made plans to move to Austin with his wife Judy. A diagnosis of Parkinson's set him back but he was optimistic about his condition's slow progress and was getting the most advanced treatment possible when he was living near Houston. I had not seen him for a few years until we met him in a restaurant during a road trip to New Orleans and he walked past a window so slowly and stiffly I thought it was a little old widower come for the lunch special and to be around people. Murph was making his slow exit. Gennady Stolyarov II and his wife Wendy Stolyarov do not believe in death. They think science and technology can solve it and, until it does, we need to begin thinking that our end is not a foregone conclusion. They are preaching this gospel of eternity to children in a new book they have written called, "Death is Wrong." First, they think, the cultural perception of mortality has to be changed, and the best method to achieve that goal is to begin with teaching children. Ages eight and up are asked to consider the notion that they can be immortal. The Stolyarovs have begun an online fundraiser to publish 5000 copies of their book and begin distributing them to families. Believers in dramatic life extension have been invigorated by Google's moon shot project Calico and the hiring of Ray Kurzweil, an artificial intelligence expert and futurist, to direct engineering operations. Kurzweil has argued that indefinite biological life spans can be achieved by 2030. Stolyarov, interviewed by Wired magazine, acknowledged that he fears death and that has prompted his defiance of its cultural acceptance. "I don't see any shame in saying that I am afraid," he said. "For me as a person who relies on reason and understanding and anticipation of the future, this is the only condition that's truly unknowable. If you cease existing, what's that really like?" It's not like anything, probably. There is now, however, no reason to be afraid. Nanobots and drug therapies and various other scientific advances promise a possible reverse to the damage caused to human bodies over the course of time. Cells will be revivified instead of decaying. Why not believe this is possible, Stolyarov asks, because the first part of accomplishing immortality is to believe it is possible and dying is not required. Teach that to the young and the world will change. Death, he insists, is wrong. Murph did not hang out much after he got to Austin. He began to focus on his condition. As his dementia increased, he sought alternative therapies like deep brain stimulation but learned he was too far advanced to be considered for the treatment. He kept asking me to take him around to assisted living centers because his marriage of twenty-five years was in trouble. I drove and talked to him and listened as he asked me the same questions several times over the course of a few hours. When we drove past a facility we had visited a few hours earlier he liked what he saw and wanted to go inside for a tour and had no memory of having previously spent a half hour asking the manager questions. We went to get Mexican food one bright afternoon and as he was getting out of my car he began to bounce and lose balance and started running to regain stability. I caught him before he had reached the creek. Murph ate slowly like my father near the end of his life and he could not speak loudly enough to be heard in the noisy restaurant. We were late for an appointment to have a chiropractor "adjust" his back and Murph left most of his food on the plate. I opened the door for him and held it for a group of women walking up behind us. When I turned around Murph had begun bouncing and teetering forward and ran to get his feet under him and he fell hard on his face across the concrete. There was no time for me to reach him before he had busted his lip open and scraped his cheek. The women helped me get him to his feet and Murph cracked one of his disarming jokes but he wiped the blood from his mouth eagerly when one of the women handed him a tissue from her purse. "Still going to extremes to meet girls," he said. "You can see it works." I laughed and got him into the car and as we pulled out of the parking lot I saw the tears on his face. Murph was too smart for his affliction. He knew what was coming. There were more falls and less memory. The MSU memorabilia he collected and that lined his walls would lose meaning. He would forget the autumn afternoons waking beneath the orange and yellow trees filled with anticipation and talking with friends on the way to the football stadium. Who he was, what he knew, what he could do, was going away. And he did not want anything to do with what he was about to become. A Saturday night in February, Murph took several bottles of muscle relaxers and maybe some ecstasy and went to sleep. When he did not awake the next morning, Judy, his wife, had him transported to an emergency room. Tubes were inserted; he was stabilized, and taken to intensive care. Over the course of the next few weeks, he opened his eyes a couple of times. Murph heard my voice and awoke and looked at me, unable to speak because he was intubated, and tears trailed down his cheeks. I asked him if he wanted to stay around or go and that he if chose to stay around to blink his eyes. I did not know if he lacked the power to blink but there was no response. He went back into his coma. Judy wanted to sign a DNR, do not resuscitate order, in the event Murph went into cardiac or respiratory arrest but the hospital ran background checks and discovered that they had filed preliminary divorce papers. Hospital ethics no longer allowed her authority over her husband and a committee authorized me to disconnect my college roommate from life support. I only wondered about the possibility of Murph regaining enough cognitive perception to tell us what he wanted but his doctors assured his wife and me there was very little possibility of such a development and I knew what his desire was based on the behavior that had led him to that ICU. I thought about the yellow house we lived in on Cedar Street with three college buddies and how we sat on the porch and drank beer and dreamed up our futures and I envied Murph's musical talent and the way everyone in a room stopped when he started to play the piano. I do not think he liked the attention but I know he loved the music. His life was full but he would have been a funny old man and a good friend to laugh at mutual frailties and our naïveté's as the light faded. Murph was self-effacing and always good at giving others reassurance and comfort. He only lived three days after he was disconnected and died on his birthday. I know he did not want to go and enjoyed living but he felt he was given no choice by his genetics. Nobody wants to lose control. And nobody really wants to die. I want to live a million years and see what happens and if we ever figure out how to exist together and responsibly manage our resources and technology and how far we will reach into space. I know Murph wanted that, too, but he could not have it. In the fall, when our old campus is alive with people cooking outdoors and throwing footballs and the band is marching proudly along the Red Cedar River, I intend to return and find a spot for Murph's ashes. He never really left Michigan State University and he deserves to be a part of it for all of its remaining springs and autumns as students gather to learn and dream and live. That way, he, too, might live a thousand years.